A sharp memory comes in handy for Tandon as he juggles ITC’s varied businesses that range from cigarettes and farm exports to hotels and information technology. Tandon, who joined the diversified company about 30 years ago and took over as finance chief in August 2009, is the overall winner in this year’s Survey. He also topped the category of sustained wealth creation among large companies. Tandon took over as CFO at a time when the global economy was recovering from a slowdown. Most of ITC’s businesses are recession-proof, be it cigarettes, consumer goods, agriculture or paper. “Except the hospitality business, none of the businesses was affected by the downturn,” says Harsh Mehta, analyst with brokerage HDFC Securities. ITC’s performance on all key parameters – revenue, profit, profit margin, cash reserves and debt – has improved every year since Tandon assumed charge of the finance department. Net sales, for instance, have grown at a compound annual rate of 28 per cent since 2009/10. ITC entered the non-tobacco consumer goods segment in 2001 with the launch of branded food products. Many of them, such as Aashirvaad flour and Sunfeast cream biscuits, are now market leaders. However, even as revenue from the segment grew at a rapid clip, it posted losses for several years. In 2011/12, the segment reported a loss of Rs 215.08 crore on revenue of Rs 5,526 crore. The tide is turning now. For the quarter ended March 2013, the segment posted its first operating profit of Rs 11.8 crore. Should the company have opted for acquisitions to grow the consumer goods business and make it profitable faster? No, says Tandon. He says ITC will have to pay as much as Rs 10,000 crore to buy a consumer goods’ maker with an operating profit of Rs 500 crore. This is because, typically, the enterprise value of an established company in the sector is 20 to 25 times its operating profit. The cost of servicing that Rs 10,000 crore, in terms of the cost of capital, will be Rs 1,300 crore a year. Building own brands is more cost-effective, he says. Even after ITC has spread its wings, the cigarette business continues as the thrust area, as it generates the biggest chunk of revenue. In June last year, the company launched smaller cigarettes priced at Rs 2 a stick. The decision coincided with a ban on gutkha, or chewing tobacco, in several states. “It was not intentional. The excise duty structure in India is such that there was an opportunity to launch smallersize cigarettes,” says Tandon. Another interesting decision the finance department took was to stagger the increase in cigarette prices. In 2011/12, ITC raised cigarette prices by about 14 per cent over several months to offset an increase in excise duty. Previously, prices were increased in a single step, which affected sales volume. But due to staggered increases, sales volume actually rose last year. Tandon says the biggest challenge has been the rapid growth of illegal tobacco products due to high taxes levied on the cigarette industry. Tobacco products that are either lightly taxed or evade taxes make up 86 per cent of the market, he adds. Under Tandon, ITC’s finance department has led several other initiatives to reduce the cost of operations and improve margins in the recent past. In the consumer goods business, the company previously had warehouses at locations where some redistribution was required. This added to the overall cost of the product. “We have reorganised the logistics network in a manner that redistribution has come down significantly,” says Tandon. What are Tandon’s mantras for managing money? Bringing efficiency to capital is important, he says. “Money should not be lying idle. Our cash balance is zero every day. We have a robust system of forecasting sales and we know our expenses. The surplus gets reinvested in market instruments on a daily basis.” As a result, ITC’s return on capital employed – a measure of efficiency in converting capital into profit – has improved to 45.4 per cent in 2011/12 from 36.8 per cent in 2008/09. “Shareholders look at how an organisation is exploiting the opportunities available. We are investing in value drivers which will create earnings growth for the future,” he says. Emirates has dropped its business class fare to shore up occupancy on its flights as demand for premium traffic in Europe and the US remains subdued. The Dubai-based airline has announced a three-day sale on its business class worldwide beginning today and for travel between July 12 and August 4. The new fares are about 20 per cent lower than its normal fares. Emirates operates all wide-body aircraft to 134 destinations globally and has 185 weekly flights to India, the highest by any foreign carrier. About 60-70 per cent sales of its India flights happen locally. It operates five daily flights to Mumbai each having 42 business class seats. This adds to 210 business class seats to Mumbai alone which it needs to fill up daily. In contrast, rival Etihad Airways flies only daily flight between Abu Dhabi and Mumbai with 16 business class seats. Emirates flies to 10 destinations in India and has flown 26 million passengers from India over the last 10 years. It has over 12 percent market share of India’s total international traffic. 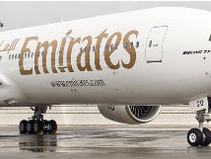 About 55 percent of all Emirates passengers travel onward. The discount sale has been launched to boost forward bookings in the holy month of Ramadan, which begins next month. “I think their load factors are low,” a travel agent said. According to sources, Emirates load factors between India and the United Arab Emirates are above 80 percent for most part of the year. “I think the Emirates sale could be a part of strategy to take on Jet-Etihad alliance,” said Pradip Lulla, general secretary of Travel Agents Federation of India. “Emirates provides specially tailored products and service to its business class passengers to accommodate their requirements while on the move; from priority check-in to baggage handling, chauffeur drive service and dedicated lounges and excellent onboard catering”, said Essa Sulaiman Ahmad, the airline’s vice-president for India.